Lets take a look at the cost of typical residential NYLON carpet and how long a carpet might last depending on what grade or quality level you choose. 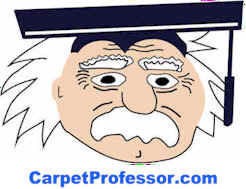 To learn what grade of carpet YOU need to select take my Carpet Foot Traffic Test. Specifications - 40 to 65 ounce face-weight, 100% Nylon BCF fiber.